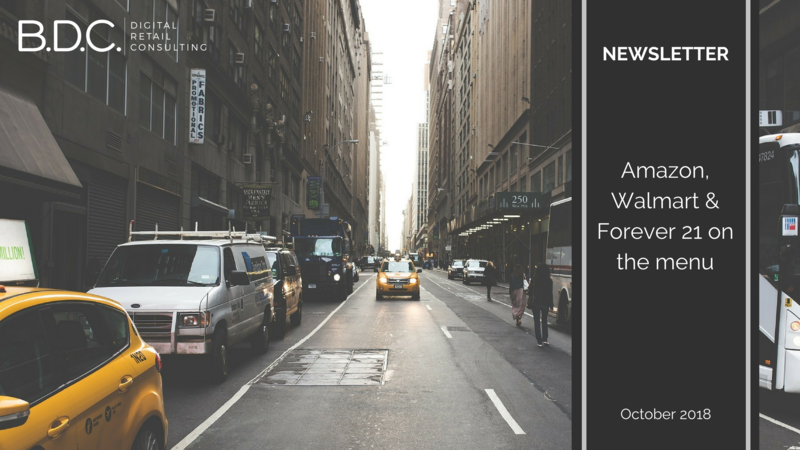 Discover the three digital retail news that get our attention this month. Amazon confirms its ambition to become a significant actor of the physical retail. On Thursday, September 26th, Amazon has opened a new store called “Amazon 4-star” in Soho, NYC, to sell its most popular or best-rated merchandise (4 stars and more) on its website, from quirky kitchen gifts like a triceratops taco holder to popular books, board games, laptops, Alexa-enabled devices and even items from Amazon’s in-house brands, like Amazon Basics. The company will be rotating inventory out on a weekly basis, as items become more or less popular on its website. 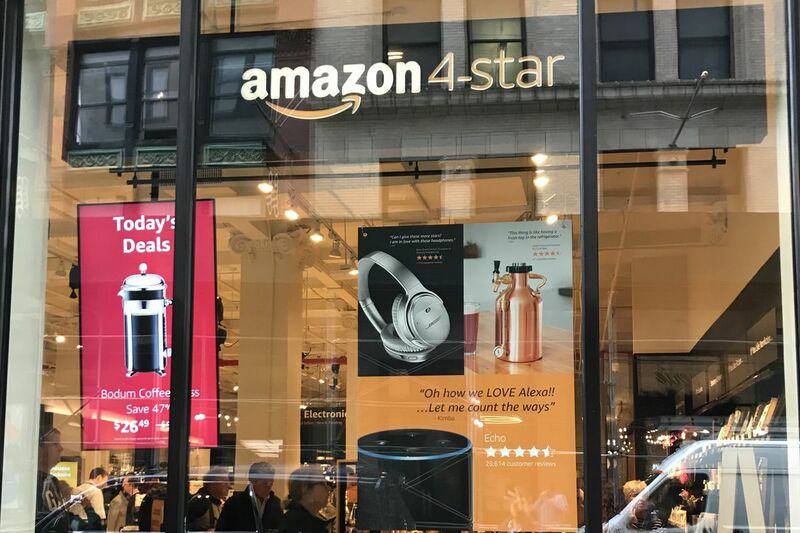 “Today, the average rating of all the products in Amazon 4-star is 4.4 stars, and collectively, the products in store have earned more than 1.8 million 5-star customer reviews,” the company said in a press release introducing the retail store. In the same way as “Amazon Books” stores, there are features throughout the store like “Most-Wished-For,” a collection of products that are most added to Amazon.com Wish Lists; “Trending Around NYC,” hot products that NYC-area customers are buying on Amazon.com; “Frequently Bought Together”; and “Amazon Exclusives.” These features, along with customer review cards with quotes from actual customer reviews, make it reassuring and fun to shop. Walmart never succeeded in opening a store in New York, but the world’s largest retailer will develop its footprint in the city thanks to its e-commerce company Jet.com that will inaugurate a 205,000 square-foot-warehouse focusing on grocery, home goods and general merchandise fulfillment in Bronx neighbourhood this fall. Jet.com unit was bought in 2016 by Walmart for $3.3 billion to face the outstanding development of the e-commerce giant Amazon. With a revamped Jet’s new push into New York, Walmart is trying to reach beyond its core base of big-box stores in rural and suburban America and compete for higher-income urbanites. Indeed, this opening will allow to deliver young urbans’ orders in next- or same-day window. Previously, Jet delivered groceries to New York and other Northeastern cities, but generally in two days via parcel services like FedEx Corp. Walmart has said it plans to offer same-day grocery delivery from its U.S. stores in 100 cities by the end of the year. Forever 21 is part of an $8-million investment in DailyLook. The Los Angeles-based startup provides an apparel subscription service. It daily curates a personalized collection of items according to the body shape, preferences, and lifestyle of subscribers. The customer receives its box at home once par month and keeps and buys what she wants and sends back for free what she does not like. “Rather than building a subscription program from ‘scratch,’ Forever 21 continues to invest in this startup as a way to learn about subscription, leverage data for its stores and fuel retail customers into a model that creates an ongoing annuity business model,” said Jim Fosina, founder and CEO of Fosina Marketing Group. It will enable Forever 21 to refine its customers’ profiles and thus adapt its in-store inventory for more revelant offerings.